Got another great but uncommon rhubarb pie recipe. This time I used a simple almond filling; called frangipane. It’s is just a sweet layer under the rhubarb but it’s quick to make and blends in: you won’t really notice the frangipane but its flavor will be delish when you bite into this luscious pie. This is easy to make even though it has several steps. Keeper recipe! The GF crust will work for any pie you wish and the sugared topping is a great look and a crunchy sweet treat. This is one of the few two crust pies I do and I have to say the top crust was very flaky and tasty. Mix dry ingredients in bowl of stand electric mixer. Add butter and mix until crumbly and resembling coarse meal. Add egg and juice. Mix until it comes together into big chunks. Shape into two equal balls with your hands. 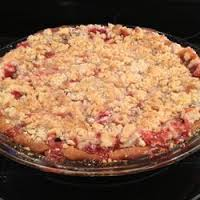 Put each on a crust sized piece of wax paper (14 x 14 inches more or less), flatten the crust balls some; put on top of it another piece of wax paper and chill it all in your fridge 15-20 minutes while you chop the rhubarb into ½ inch chunks. I now use a rectangle of medium thick plastic; fold it in half and roll out the pie dough between the layers; works much better than wax paper. Spread frangipane filling on the bottom of the crust. Fill with dry rhubarb mix. Roll out the other pie crust. Place gently on top of pie, crimp around edges. Cut a few vent slits in the top crust. Brush top crust carefully with milk, sprinkle heavily with raw sugar. Place on baking sheet to catch drips (I have a pie drip pan I love!) Bake 20 mi, rotate it half way through so the back and front are the same level of golden. Lower heat to 350 degrees. Bake for 30-40 min until crust is golden and you can see the filling bubbling. Cool on rack for at least 1-2 hours before serving. Enjoy! Originally posted spring of 2016, no changes to recipe, minor updates to text. Everyone loves ice cream. In my family, everyone loves a pie. So I was looking for something different when I saw a recipe somewhere, can’t remember where but it fit my search requirements plus it was gorgeous but somehow I lost the recipe so I did my best to replicate it for my family. We had it over the Easter weekend. It was a big hit. Remember baked Alaska? A dessert of the 70’s? It is a fancy construction of a layer of yellow cake topped with a mound of ice cream and then covered with a thick layer of meringue which is briefly baked in the oven to brown the meringue lightly. Well, introducing the Baked Alaska Pie! Gingersnap crust, coffee ice cream and the traditional meringue topping. Not as heavy because the pie crust is ¼ the thickness of the layer of cake in a standard baked Alaska and gingersnap is a pow of a flavor compared to the blandness of yellow cake. The coffee ice cream pairs with it exceptionally well but I am betting chocolate ice cream would be crazy good too! I suppose you could do a graham cracker crust but what would be the fun in that? The meringue is not overly sweet and is fluffy perfection with the ice cream and cookie crust. This dessert is remarkably easy to do but you must have patience as there are several steps and a lot of chilling in the freezer. If you are not needing to be gf you can use a regular gingersnap crust. Directions: Use your food processor, blender or a baggie and a rolling pin to reduce the cookies to a fine crumble. 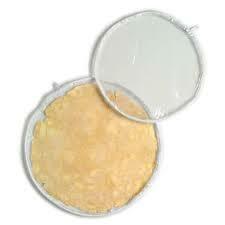 Pour them in a mixing bowl, add the butter, stir well and pour into a 9 inch pie tin. Press across the bottom and up the sides. Bake at 350 for 6-9 minutes; take out before it browns much. Let cool completely before next step. Not a very pretty picture; just doesn’t convey the incredible flavor. I took this of a leftover slice out of my freezer; we were too busy eating it to take pictures that day! So it lost some of the browned topping in my freezer. It was very pretty when we first cut the pie.